Some pages that may once have supplemented Blok’s remaining two were possibly amended by their final captioner. For three December 15th views of what today is Cape Foulwind we seem to have a caption that’s been copied twice: in SAC it reads: “Thus Appears the Main landt to South of the rocky point When you Sail along the Coast and Views of the Rocky point Which Appear thus as you can See below”, then: “Thus appears the State landt to South of the Rocky point when you Sail along the Coast and Views of rocky point which Appear thus as you can See here below” (Sharp, p.125). These are the same except ‘State landt’ replaces ‘Main landt’ in the lower one. That name was not decided on till four days later, the 19th . 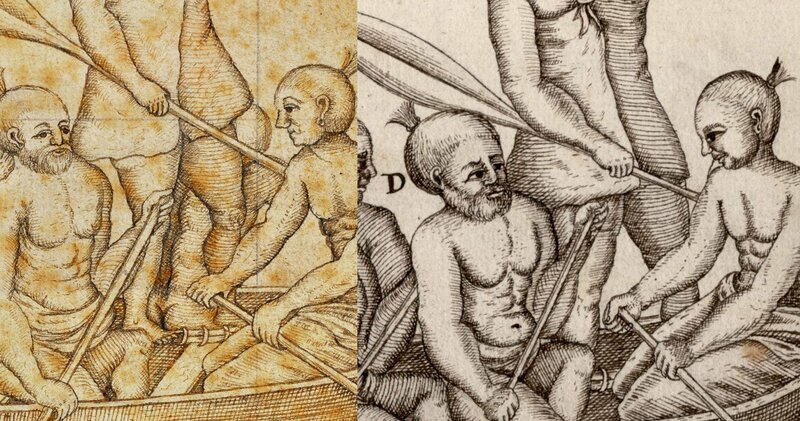 If Heemskerck’s draughtman captioned all his prior coast views ‘Main landt’ at the time of drawing them, Gilsemans might, back in Batavia, have copied ‘Main landt’ first but on reflection chosen to repeat the caption using ‘State landt’ and to go on using that, since using different terms in different captions might confuse his VOC intended audience, suggesting separated coasts. On this page there was room for two such ornamental captions, though effectively their meanings are identical. It’s just a minor detail but does suggest just how laborious and complex was the duplication of those several illustrated day registers. In The Blok Fragment and the State Archives Copy compared (2012) Collins concludes Blok is the source of SAC. 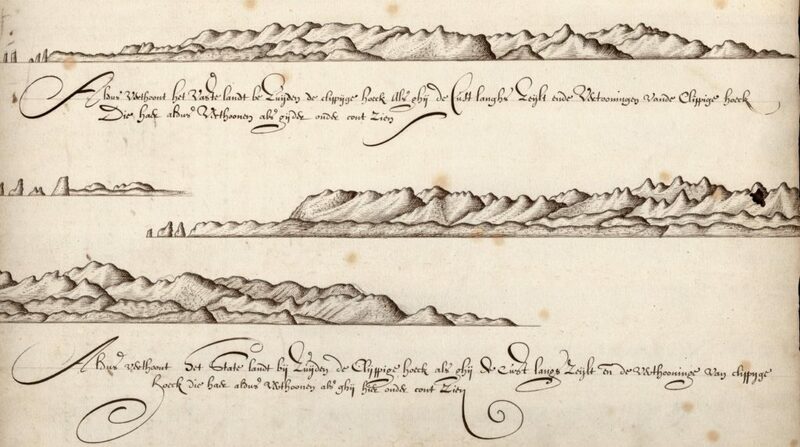 He writes: “the manuscript of which only the Blok fragment survives was the source of the SAC drawing”. 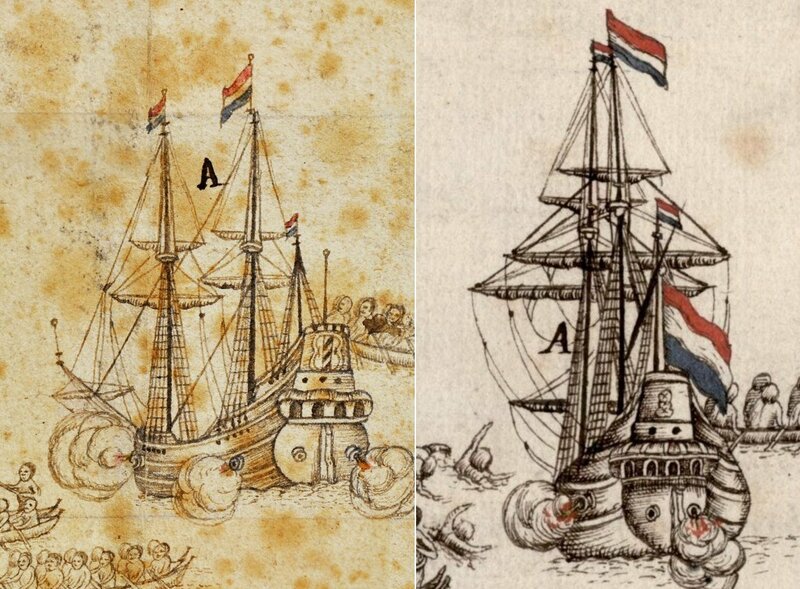 In order to decide this for ourselves we need to view them both in detail as Collins does; he says: ” The two Dutch ships in the lower left corner of Blok are both firing cannon from the stern, but are not doing so in SAC. 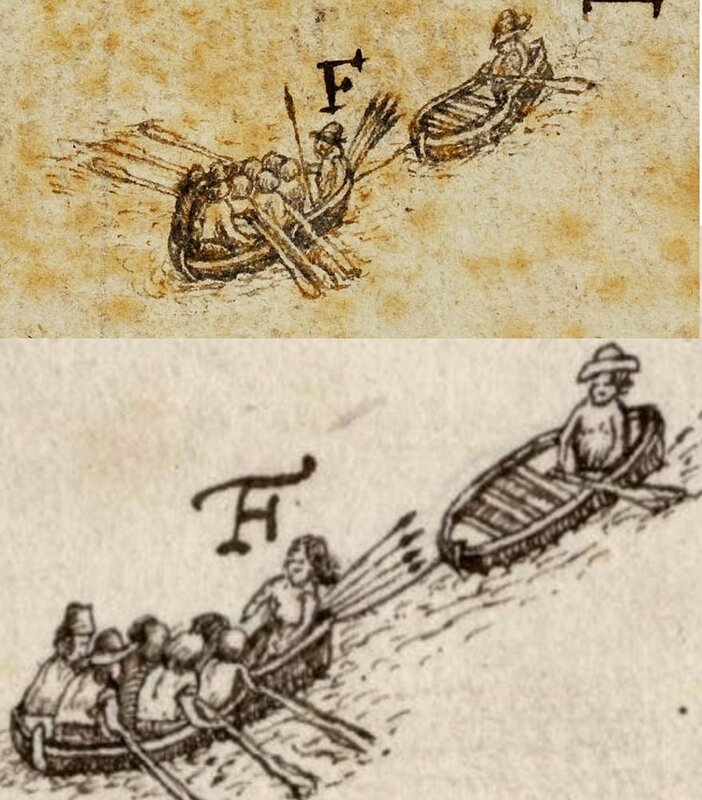 “Towards the lower left corner of each version, there are two Dutch rowboats, one towing the other: in Blok the boat carrying several men has, as one would expect, oars on each side, whereas in SAC this same boat has oars on one side only—surely evidence of the copyist’s carelessness. “More interesting is the treatment of the group of nine tiny canoes beneath the stern of the large canoe. 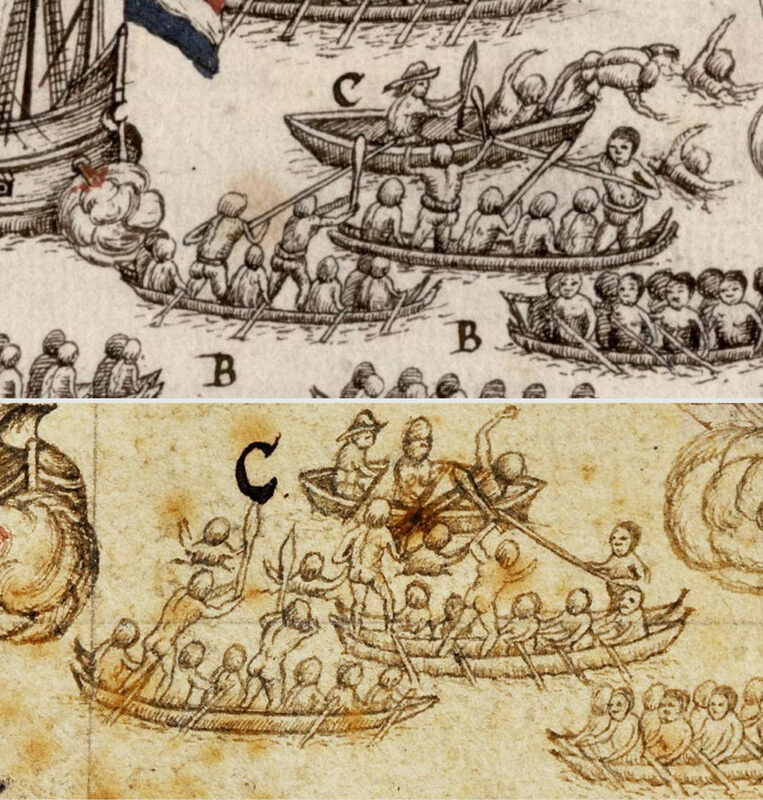 In Blok, what is clearly a double canoe is shown joining the group at an angle: thus a detail of ethnographic interest is incorporated into what will become, in SAC, a less animated vignette with its nine canoes all lying strictly parallel to each other and all apparently single canoes. Collins is right, the waka has a crew of twelve in Blok eleven in SAC, and it’s unlikely that a figure so obscured would have been added later by a copyist. Like Collins, I see this omission in the SAC as powerful evidence that Blok is the original. I’ll note another feature here that Collins doesn’t comment on. In SAC the standing figure takes the place of the omitted kaihoe (paddler) and he stands where that man’s buttocks can be seen in Blok, inside the forward part of the left waka hull. This standing figure possibly a kaiarahi, has both feet on the two rauawa (top-strakes) in the Blok, which are shown lashed together as if that was how the two hulls had been joined. Haelbos describes the waka seen in Golden Bay as “canoes, bound together two and two, and with planks laid over the sides” while Tasman’s Journal says “their craft were two long narrow canoes beside each other, over which some planks or other seating was laid, such that above water one can see through under the vessel” Both these descriptions suggest waka hulls spaced a short way apart with spars or planks lashed over them by which they are secured to form one waka hunua (double canoe) Some waka hunua may have been joined hull to hull. Best’s The Maori Canoe reports one Ngapuhi source as saying that two forms of double canoe were formerly employed by that iwi. One of these “consisted of two canoes placed side by side, close together, and so secured. They were fitted with top-strakes. The other type … had the two canoes secured about 30 in. apart. I’ve found no evidence apart from Blok and SAC suggesting waka hulls were ever joined only by lashing rauawa together, and since such a method seems unlikely to have worked structurally, my 1642 waka hunua reconstructions are all bound together by means of lashings to cross-spars or planks lashed to all four rauawa, as shown here. I think the close-up waka drawings in the Blok and SAC must be inaccurate in this respect, and textual evidence from Tasman and from Haelbos has it right. I also think a kaiarahi would stand above the rauawa as in the Blok, and SAC probably moves his feet down in the hull just to make more room for repositioned captions overhead. This also probably explains the missing head feathers in SAC, a change which Collins calls “at odds with the text it illustrates”. The text in question reads: ‘these people were (as far as we could see) of ordinary height but rough in voice and bones, their colour between brown and yellow, had black hair right on top of the crown of the head fastened together in style and form like the Japanese at the back of the head but a bit longer and thicker of hair; upon which stood a large thick white feather’. Wallace observed in 2002 that Maro (waist bands worn in war) appear in SAC’s attack but not in Blok’s. Accordingly for her the SAC was more authentic than the Blok and as such likely to have been the earlier work. 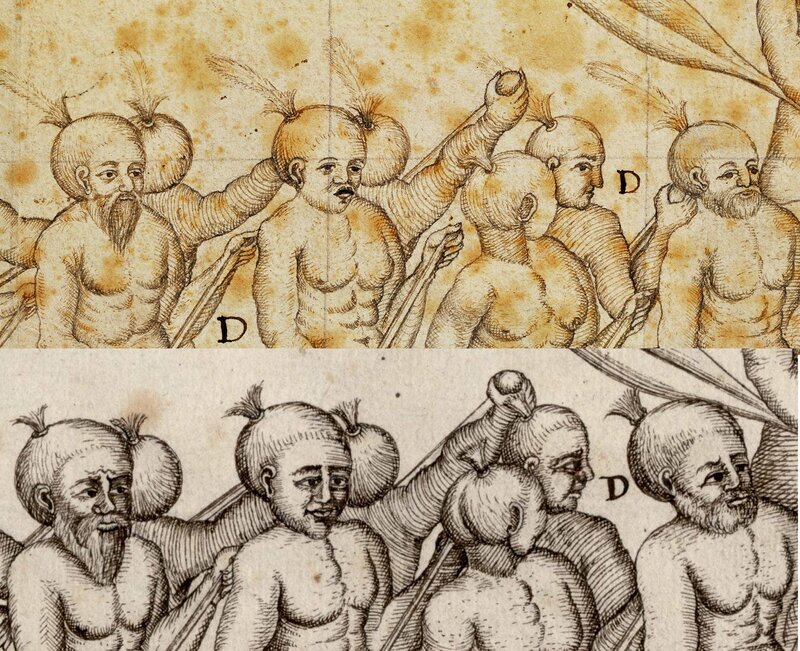 But it is also possible the Maori warriors in SAC were partly based on other documentary sketches which the artist didn’t draw on in creating his first draft. Blok’s ‘View of Murderers Bay’ appears to be that working draft which in a later finished version became SAC. The alterations evident in SAC are just the sort of changes we’d expect where a draft image has been reconstructed, modified and finalised. A comment here from ‘Onewhoknows’ has been removed because anonymous hostile comments seem a bad idea.